There are a lot of things I want to do in 2016 and a lot of goals I want to meet. Whether or not you are someone that sets “resolutions” or goals for a new year, I still think it’s important to challenge yourself to try new things, break bad habits, or to make improvements to your daily lives, regardless of it being the beginning of a new year or not. One of the things that I always try to do is to create little highlights in other people’s days. It can be as simple as sending a little note or putting together a care package, just because, to send their way. I’ve found that it can really cheer someone up when they’re having a bad day or when they just need a little pick me up. Plus, it couldn’t be more simple to do! This year, one of the ways I’m going to go this is to send a birthday card to my friends and family in the mail. Yes, the ACTUAL mail. Not a birthday message on Facebook, not a text message, an actual card that is sent by way of USPS. Crazy, right? (Yes, that is sarcasm at it’s finest). The days of sending sail mail are definitely behind us and I don’t want to lose out on the highlights that an actual piece of mail can bring. When our mailboxes are usually stuffed with ads, bills, and catalogs, it’s nice to get something else in the mail that you actually want to receive. I’ve partnered up with Tiny Prints and we’d love to challenge you guys to do the same with the ‘Birthday Card Initiative’ this year for the people in your lives too! 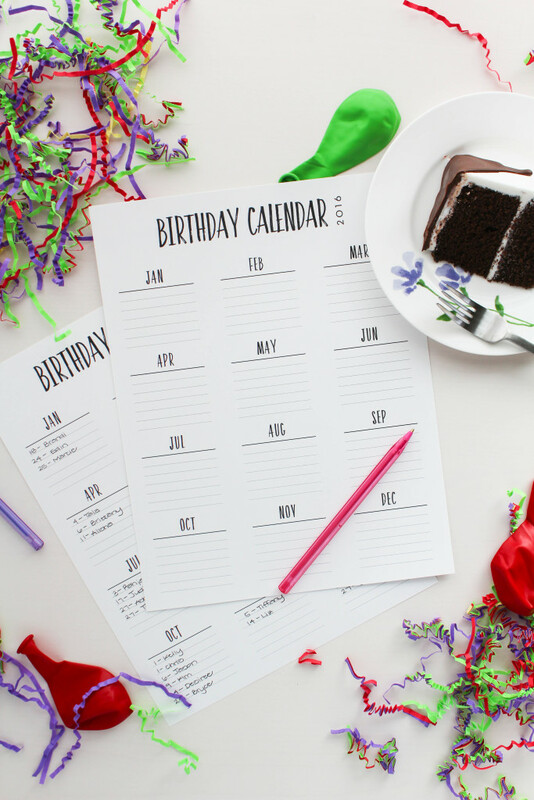 It’s definitely an easy thing to do and I’m making it even easier for you to track all of your upcoming birthdays with a free birthday calendar printable that you can download and print too!